Make sure you understand the AFR+ basics first before beginning the tuning process. Click here to view the AFR+ basics. FUELING MODES - Modify the fuel amount compared to the stock fuel when the corresponding zone is active. Pressing the Right (->) button will lean out the AFR and pressing the Left (<-) button will richen the AFR. Fueling modes can be closed loop or open loop. The displayed AFR values for OPEN LOOP modes are just numbers to reference. The displayed AFR values for CLOSED LOOP modes are actual targeted AFR values. SWITCH POINT MODES - Determine the transition point between two corresponding zones. The higher the setting the longer it takes for a zone to engage. The lower the setting the faster a zone will engage. Switch point modes do not have to be adjusted that frequently. The displayed AFR values are just numbers to reference. 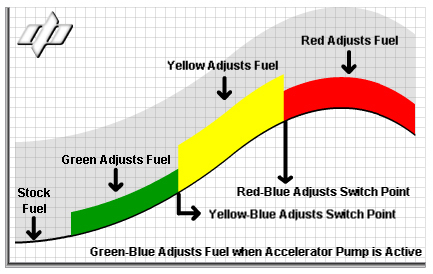 Do not assume from the example drive cycle that the AFR+ system has simply low, mid, and high range fuel adjustments. For illustration purposes only the graph shows the natural progression through the zones for one given gear. The AFR+ system implements Dobeck's load based technology.